If I wasn’t already scared of heights, I definitely would be after seeing Everest. Based on a true story, Everest tells the story of two expeditions attempting to climb to the top of Mt. Everest. One expedition is led by a New Zealander named Rob Hall (Jason Clarke), an experienced climber who, we’re told, pretty much invented the entire industry of taking commercial expeditions up to the top of Mt. Everest. Criticized by some for being a “hand holder” who gets too emotionally involved with his clients and, as a result, cheapens the Everest “experience” by helping weaker clients make it to the top of the summit, Rob is married to a fellow climber, Jan Arnold (Keira Knightley). While Rob tries to lead his clients to the highest place on Earth, the pregnant Jan stays home and waits for his return. Everest details what happens when the two expeditions are both caught in a sudden blizzard and find themselves trapped at the top of Everest. The rest of the film is about the attempts of a stranded few to make it back to civilization. A few make it, though not without suffering a good deal of pain and, in one particularly case, sacrificing a few body parts as a result. Tragically, several others fall victim to the whims of nature, some dying of hypothermia while others, hallucinating from the lack of oxygen, literally walk off the side of the mountain. Everest is one of those films where men die tragically but we’re supposed to find some sort of comfort from the fact that they died doing what they loved. To be honest, I usually have a hard time buying into these type of narratives. For instance, I love shopping but I wouldn’t expect anyone to be happy for me if I died while looking for a new purse. (In fact, that’d probably upset me if not for the fact that I’d be too dead to know about it.) At the same time, guys seems to love movies like this and I think, in the future, Everest will probably be remembered for being the epitome of a guy movie. And that’s not meant to be a criticism on my part! Everest does what it does with a lot of skill and confidence. It’s an exciting film that, once the disaster hits, will leave you breathless. And yes, at the end of the film, I did shed a tear or two. Narratively, there’s really not a surprising moment to be found in the entire film. I went into Everest not even knowing it was a true story and I was still able to guess who would survive and who would not. But Everest‘s amazing visuals make up for the predictable narrative. The term “visually stunning” is probably overused (especially by me!) but Everest is truly a visually stunning film. For someone like me — who has asthma, a huge fear of heights, and who lives in North Texas (where, regardless of what you may see in the movies, the land is remarkably flat) — Everest is probably as close as I’ll ever get to climbing a mountain. I should also mention that it never ceases to amaze me that Josh Brolin was born in Santa Monica, California because, on the basis of this film and No Country For Old Men, he is one of the most convincing Texans to appear in the movies. In this film, he plays Beck Weathers, a Dallas doctor who is a member of Rob’s expedition team. Usually, of course, if a Texan (especially one who is specifically identified as being a Republican, as Beck is at the beginning of a film) shows up in a movie, you know he’s going to end up being the villain. Fortunately, Everest was based on a true story and, as a result, Beck turned out to be one of the most compelling characters in the film. (If you know the story behind the film, you already knew that. However, I went into Everest blind.) Josh Brolin brings a lot of strength to his role and to the film overall. Everest may predictable but it’s still an exciting film. Make sure that you have someone beside you to whom you can hold on and that you see it in 3D! I can still remember what it felt like, back in 2010, as I stepped out of the theater where I had just watched Winter’s Bone. I had just spent 100 minutes engrossed in that film’s world and it was somewhat jarring to suddenly find myself back in my world. The air around me was still. The clear sky above me seemed to be a totally new shade of blue. The sounds of passing cars and overheard conversations echoed in my head. When I walked, I felt as if I was moving at a different, dreamier pace than everyone else, as if I was still only partially back in my world. That’s the type of film that Winter’s Bone is. It’s a film about life on the fringes, a portrait of a very real part of America that a lot of people don’t even realize exists. It’s a film that sticks with you and dares you to try to forget the people who it has introduced you to and the stories that it tells. 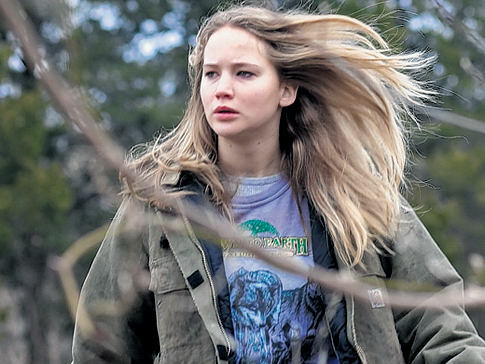 Winter’s Bone takes place in the Ozarks, a society and world that is dominated by meth and secrets. Speaking as someone who still has family who live on the outskirts of the world depicted here, I can say that Winter’s Bone gets both the big picture and the little details right. Everything from the unbreakable cycle of poverty to the defiant resilience of the people is depicted just as it is. Make no mistake about it — the people in Winter’s Bone may not have much but they do have their pride. It’s portrayed best in the scene where meth head Teardrop (John Hawkes) glares down the county sheriff (Garret Dillahunt), letting him know that, regardless of who is wearing the uniform, this is Teardrop’s world. Teardrop is the uncle of 17 year-old Ree Dolly (Jennifer Lawrence), who is considering joining the army once she graduates from high school but, for now, spends all of her time taking care of her mentally ill mother and her two younger siblings. Her father, who is one of the county’s best meth cooks, was recently arrested and has a court date approaching. However, he has apparently skipped bail and disappeared. When Ree is told that, unless her father shows up for his court date, she and her family will lose their house, Ree sets out to try to find him. Ree, however, knows that her father would never have jumped bail and she also knows that there’s no way he died in a meth lab fire, as some people are claiming. She knows that her father has been murdered but, unlike Teardrop, Ree has no interest in getting revenge. 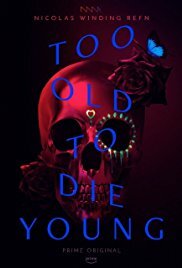 She just wants to find his body so she can prove that he’s dead and her family can keep their home. Unfortunately, even this brings Ree into conflict with the local crime boss. Taking place on a blasted landscape of dilapidated farms, rusty pickups, and the burned ruins of abandoned meth labs, Winter’s Bone is an unusually powerful piece of Southern gothic. It’s also a film that — unlike a lot of other acclaimed movies — actually gets better with repeat viewings. When you first see it, you’re overwhelmed by the film’s bleakness. When it ends, you’re not sure if you should be happy or sad. The second time, however, you can better appreciate the skill with which director Debra Granik tells her story, the way she frames Ree against the landscape as if Ree was the lone hero in a classic western and how the scenes where Ree searches for her father in a swamp are full of shadows and menace. The third time, you can better appreciate the performances of characters actors like John Hawkes, Garret Dillahunt, and especially Dale Dickey. The fourth time, you no longer have any doubts. 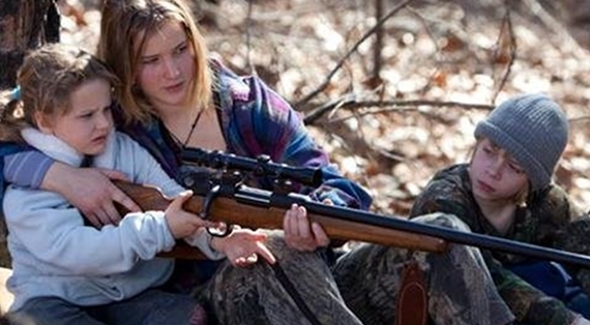 Winter’s Bone is one of the best films that you’ve ever seen. And, through it all, Jennifer Lawrence is there and reminding you why she became a star in the first place. 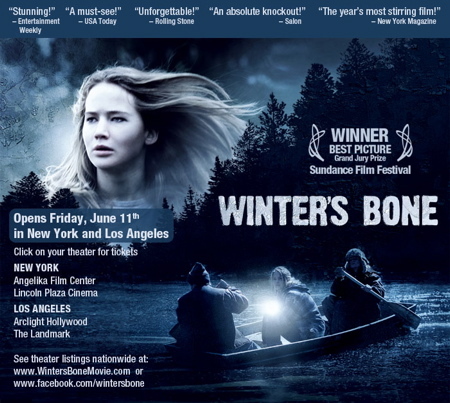 She may have won her Oscar for Silver Linings Playbook and she may be best known for being the face of The Hunger Games franchise but Winter’s Bone remains Jennifer Lawrence’s best and bravest performance. Without a hint of vanity or reluctance, Lawrence portrays Ree as a resilient and unsentimental survivor and you can’t help but cheer her on as she refuses to back down to any authority, legal or otherwise. By the end of the film, you know that Ree is probably as trapped as anyone but you can’t help but hope that she’ll somehow find something better. If you haven’t seen Winter’s Bone, you need to. If you’ve read my previous reviews here on the Shattered Lens, that’s not necessarily a major revelation. Still, before I talk about Steven Spielberg’s latest film, the sure-to-be Oscar nominated Lincoln, you should know where I’m coming from as a reviewer. Cinema may be my number one love but history, and especially political history, runs a close second. To me, there is nothing more fascinating than learning how those in the past both viewed and dealt with the issues that we still face in the present. Whereas some people take pride in being able to name every player that’s ever played for the Dallas Cowboys, I take pride in the fact that I can not only name every President and Vice President in order but I can also tell you exactly who they had to defeat in order to serve in those offices. I love history and therefore, it was hard for me not to feel as if Lincoln was a film that was made specifically for me. Covering the final four months of the life of the 16th president, this film tells the story of Lincoln’s struggle to pass the 13th Amendment and to bring an end to the U.S. Civil War. The film also documents Lincoln’s troubled marriage to the unstable Mary and his son’s decision to enlist in the Union Army. Even though Spielberg and screenwriter Tony Kushner don’t include any vampires*, there’s still a lot going on in Lincoln and it is to their credit that the film remains compelling despite the fact that everyone already knows how the story is going to end. Daniel Day-Lewis is getting a lot of critical acclaim for his performance in the title role and, for once, I actually have to agree with the critics. Abraham Lincoln is one of the most iconic figures in American history. He is such an icon that, at times, it’s hard to believe that this larger-than-life figure, with his stove-pipe hat and his homely face, was an actual human being who lived and breathed and died like any other human being. It’s easier to think of him in the same way that Jesus Christ used to be represented in films like Ben-Hur, as an inspiring character who is always standing just a little bit off-camera. The brilliance of Day-Lewis’s performance is that he makes us believe that this legendary figure could actually exist with all the rest of history’s mortals. For lack of a better term, Day-Lewis humanizes Lincoln. His performance contains all the bits of the Lincoln legend: the fatalistic melancholy, the steely resolve, the quick humor, and occasional flashes of self-doubt. The genius of the performance is the way that it takes all the legendary pieces and arranges them to create a portrait of a very believable man. Though the film is dominated by Day-Lewis’s lead performance, the film’s supporting cast does a good job at bringing to life the people around Lincoln. Whenever one film can manage to find roles for Hal Holbrook, David Strathairn, Jared Harris, James Spader, John Hawkes, and Jackie Earle Haley, you’ve got good reason to be optimistic about what you’re about to see. Probably the film’s showiest supporting role goes to Tommy Lee Jones, who plays the firebrand abolitionist Thaddeus Stevens. Admittedly, Tommy Lee Jones gives a standard Tommy Lee Jones performance here but, especially when paired with Day-Lewis’s more internal acting style, the end result is still fun to watch. Also giving a good performance is Sally Field, who plays Lincoln’s mentally unstable wife. Historians have rarely been kind (or fair) to Mary Lincoln but Field makes her into a difficult but sympathetic figure. Finally, even though the role of Lincoln’s son is not a challenging one, I’m always happy whenever Joseph Gordon-Levitt shows up onscreen. Ultimately, however, Lincoln is a Steven Spielberg film. Spielberg is a very good director but he’s also a very safe one. The same can be said of Lincoln as a film. The film’s cinematography, art design, and costume design are all brilliantly done and award-worthy but it’s still hard not to occasionally wish that Spielberg would have enough faith in his audience that he wouldn’t feel the need to have John Williams provide constant musical cues to let us know what we are supposed to be feeling about what we’re experiencing. If you’re looking for hints of moral ambiguity, an unflinching examination of the rivers of blood that flowed on the Civil War battlefield, or for an in-depth portrait of Lincoln’s personal demons (and most historians agree that he had a few), you might want to look elsewhere. This is not Martin Scorsese’s Lincoln. This is Steven Spielberg’s Lincoln. This is a film that is meant to be inspiring (as opposed to thought-provoking) and, for the most part, it succeeds. I have to admit that I went into Lincoln expecting to be disappointed. Ever since the film first went into production in 2011, websites like Awards Daily have been hyping this film to death. Before many of them had even seen the completed film, online critics were announcing that both the film and Daniel Day-Lewis were the clear front-runners for the Oscars in 2013. As anyone who has read my previous reviews on this site knows, nothing turns me off more than the bandwagon mentality of the critical establishment. Often times, when a film is embraced as vehemently and as early as Lincoln has been, I feel almost honor-bound to be a hundred times more critical of it than I would be of a film like Step Up Revolution. However, Lincoln is a rarity. It’s a film that, for the most part, actually lives up to all the hype. *I imagine that little joke will cause a lot of confusion to anyone who, ten years in the future, happens to stumble across this review. To you, future reader who has forgotten all about Abraham Lincoln: Vampire Hunter, I can only apologize.